We're pleased to announce the establishment of a medical GP Clinic at Te Whare Wānanga o Awanuiārangi. 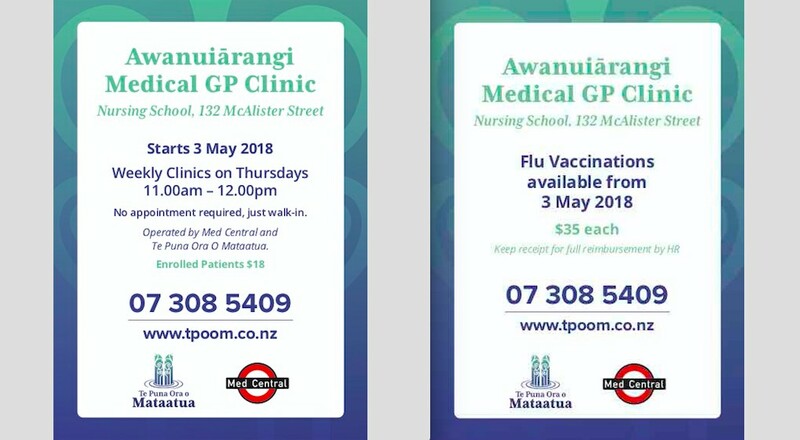 Starting on 3 May 2018, the clinic will run weekly on Thursdays 11am-12pm based at the School of Nursing. The clinic will be available for all staff, students and trustees. Enrolment packs will be available on site. The clinic will be operated by Med Central. Outside clinic hours, patients will be able to access the Medical Clinic behind Adamsons Pharmacy on King Street, Kopeopeo. This is another addition to the network of community clinics already established by Med Central across the Eastern Bay of Plenty, including Kōhanga Reo, Matata and Norske Skog, to improve access to primary healthcare. Panui to staff, students and trustees. Nau mai, Haere mai.